Paintings with light have a hidden energy—an energy that captures the attention of the viewer. 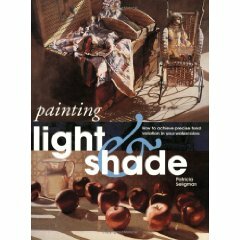 Painting Light & Shade shows artists how to precisely control light and shade in their paintings to achieve masterful results. Readers will learn how to observe light and shade, and will discover helpful techniques for painting light from the sky, capturing highlights, painting shadows, and capturing the changing nature through the day. Feature paintings from professional artists, each accompanied by a tonal sketch, are broken down into step-by-step demonstrations that focus on relevant techniques, allowing readers to learn while simultaneously creating paintings that shimmer with light. Patricia Seligman studied history and the history of art at London University. She now works as an editor and writer, and her books include Painting Murals and Step-by-Step Art School. She lives in London, England.